The NASA/ESA Hubble Space Telescope has produced an incredibly detailed image of a pair of overlapping galaxies called NGC 3314. The two galaxies look like they are colliding but it a trick of perspective. Released June 14, 2012. The Hubble Space Telescope has snapped a spectacular new image of two galaxies that look like they're slamming into each other, but in reality something just as rare is happening, scientists say. In an amazing chance photograph, the Hubble Space Telescope snapped a view of two galaxies lining up, one behind the other, as viewed from the space telescope's vantage point. The image offers a rare view of the overlapping galaxies, which are collectively known as NGC 3314, Hubble scientists said in a statement. "The two galaxies look as if they are colliding, but they are actually separated by tens of millions of light-years, or about 10 times the distance between our Milky Way and the neighboring Andromeda galaxy," NASA officials explained in a statement. "The chance alignment of the two galaxies, as seen from Earth, gives a unique look at the silhouetted spiral arms in the closer face-on spiral, NGC 3314A." NASA unveiled the new Hubble photo today (June 14) along with a video of the two galaxies aligned. The two galaxies that make up NGC 3314 are located about 140 million light-years from Earth in the direction of the southern constellation Hydra. The closer object is called NGC 3314A and is a spiral galaxy that presents its full face toward Hubble. The farther object is NGC 3314B. "This indicates they are not on any collision course," they explained in the statement. This image shows a wide field of view around the overlapping galaxy pair NGC 3314 140 million light-years from Earth in the constellation Hydra. The two galaxies look like they are colliding but it a trick of perspective. Released June 14, 2012. Scientists have gleaned some details about both galaxies using the new Hubble image. 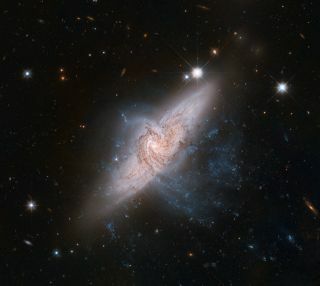 The spiral shape of the closer NGC 3314A galaxy, for example, appears to be warped, most likely due to a close encounter with a different third galaxy (called NGC 3312) outside Hubble's view, researchers said. The galactic alignment also presents another optical illusion of sorts that makes the dust lanes of farther galaxy NGC 33145B appear lighter than the ones in the closer NGC 3314A. The dust lanes only appear lighter because they are viewed through a "bright fog of stars" from NGC 3314A in the foreground, researchers said. The dust lanes in the closer NGC 3314A, meanwhile, appear as darker silhouettes in the image because they are backlit by the bright stars of NGC 3314B, they added. Astronomers created the new image of the overlapping NGC 3314 galaxies using the Hubble telescope's Advanced Camera for Surveys. NASA launched the Hubble Space Telescope in April 1990 and it has been beaming back spectacular views of the universe ever since. Hubble's mission is a joint effort by NASA and the European Space Agency.